Designer Blouse shown in the Image may not be the part of standard product.Extra material may have been used for modeling purpose. Every Lehenga comes with one Choli only so we can not provide another same Choli but we can provide you plain Choli fabric on cotton,in such case extra charges will be applicable. 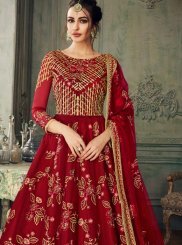 Every Lehenga comes with unstitched blouse, if you need stitched blouse then we can provide to you as per your given measurement and stitching charges will be applicable in such case. Choli will be stitched with cotton lining. If anycholi comes with shimmer fabric then lining will be used of the same fabric instead of cotton. Select Choli Size 32" 34" 36" 38" 40" 42" 44"
Select Sleeve Length 0" 1" 2" 3" 4" 5" 6" 7" 8" 9" 10" 11" 12" 13" 14" 15" 16" 17" 18" 19" 20" 21" 22"
Select Choli Length 13" 14" 15" 16"
Select Lehenga Length 36" 37" 38" 39" 40" 41" 42" 43" 44" 45" 46" 47" 48" 49" 50"